Many iron objects, both weapons and tools, from the tombs of this period have been discovered but experts find it difficult to tell whether they are Chinese or Korean products. The Chinese records suggest that iron technology was introduced from China into Korea through the establishment of Chinese commanderies in the north of the Korean peninsula. And until recently, most experts believed that ironworking in East Asia was introduced via that route at least before the 4th century BC since full-scale usage of ironware was seen in China. Chinese iron technology was already advanced by this time — China’s oldest excavated iron foundries on the Yangtze River date to the 7th century B.C. Korean experts, on the other hand, believed that indigenous development of iron technology in the south happened before the commanderies were established, beginning around the time of the founding of the Chosun state. The Han Chinese had attacked Chosun as part of its expansionist policy and in its search for more sources of salt and iron. Russian archaeologists as well, have maintained that iron technology came into central Asia at a relatively early time, when the inhabitants began to use ironware without first passing through the Bronze Age. Recent events have clarified the history of iron technology. Archaeologists have recently discovered another source of Korean ironworking technology apart from the Chinese one. Among those artifacts, the excavated ironware is made of gray cast iron, which predates the Chinese ironwork by 2 to 3 centuries. Scholars of the history of iron technology had previously believed that cast iron first appeared in China as gray iron. (Gray iron, which is made by adding graphite, requires more sophisticated technology than white iron.) This technology first appeared during the 2nd century BC in China and had spread all over the country by the 1st century BC. Archaeologists have recently finished excavating at Barabash an iron manufacturing workshop from sometime between the 7th and 5th centuries BC. Nearby the prehistoric iron manufacturing site, artifacts from the Bohai culture (or Parhae) related to those in the Korean peninsula were discovered in two places. The experts found when examining the iron relics, that stone axes had already been replaced by iron axes at this period. Archaeologists also uncovered a crescent-shaped stone knife (半月形石刀; 반월형석도), a relic that marks the rice-growing culture on Korean peninsula. There were signs at recently excavated site that the workers destroyed on purpose their iron manufacturing workshop when they migrated elsewhere. Where did the metal technology of Korea and Japan diffuse from? Iran and Iraq, the earliest tin bronzes date to the late 4th millennium BC. In Anatolia and on both sides of the Caucasus, arsenical bronzes were made by the early 3rd millennium BC. Some scholars date some arsenical bronze artifacts of the Maykop culture in the North Caucasus as far back as the mid 4th millennium BC, which would make them the oldest known bronzes, but others date the same Maykop artifacts to the mid 3rd millennium BC. Arsenic bronze however is a naturally occurring alloy, in contrary to the later used tin bronze. Tin had to be delved and smelted separately (mainly as the tin ore cassiterite), and added to the molten copper to make the alloy. Maykop was an advanced Bronze Age culture, actually one of the very first to develop metalworking, and therefore metal weapons. The world’s oldest sword was found at a late Maykop grave in Klady kurgan 31. Its style is reminiscent of the long Celtic swords, though less elaborated. 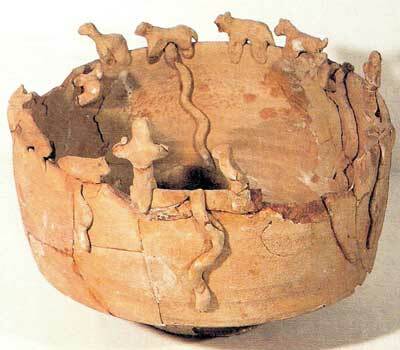 The Bactria–Margiana Archaeological Complex (or BMAC, also known as the Oxus civilization; Margiana (=Old Persian Marguš) oasis in the Karakum desert, at Merv in the southeast of Turkmenistan) is synonymous with the Bronze Age culture of Central Asia (and also associated with Indo-Iranian migrations), dated to ca. 2200–1700 BC. The Bactria-Margiana complex spans a wide area from southeastern Iran to Balochistan and northern Afghanistan. 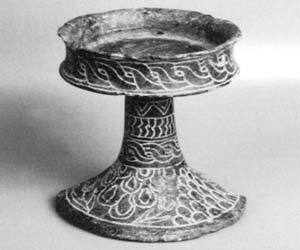 The BMAC culture interacted with the nomadic people of the contemporary Andronovo culture of the steppe to the north, as evidenced by the presence of geometric patterned steppe pottery. An excavated stone seal with geometric markings from a BMAC site in Turkmenistan contained signs that resembled Chinese inscriptions used some 2500 years later in Xinjiang. Their material culture, including monumental architecture, bronze tools, ceramics, steatite stone objects, bears a strong resemblance to(and may represent forerunner influences that were brought into Japan via Korea at the end of the Yayoi period-early Kofun Period) that of the Bronze-kurgan mound cultures of Korean and Japan. BMAC fruit vessel from Margiana (left) and animal-rimmed cult vessel(right) of the Margiana Togolok Temple-I. The remarkable similarity in all of the above Bactrian-Margiana cultural material packages with the funerary assemblages of kurgan/Kofun culture of Korea-Japan makes it tempting to speculate that one route of transmission of bronze culture/kurgan mound culture was from the BMAC region to Korea-Japan, perhaps via the corridor in the Pamir mountains. About 138 BC Zhang Qian reached the Fergana Valley northwest of the Pamirs and Buddhist pilgrims travelled on both sides of the Pamirs to reach India from China. The Pamir Mountains were considered a strategic trade route on the Northern Silk Road that connected the ancient Chinese capital of Xian to the west over the Pamir Mountains…The Chinese and the Kushan Empire of Afghanistan, had battled to control this area and eventually the Chinese General, Pan Ch’ao, won in 90 AD. He then led his army across the Pamir mountains, which join the Kunlan Range with the Hindu Kush. This led him to the Caspian Sea, where he established trading links with the Persian Parthian Empire. Emperor Wudi was said (in the Houhanshu)to have coveted the “rare things” treasures of Ferghana (Dayuan) and the possessions of Bactria (Daxia) and Parthia (Anxi) so China had dispatched multiple embassies to the region. In the far north, the Puyo (Fuyu in Chinese) people famous for exporting horses to the Chinese, then located between the Xianbei and Koguryo had peaked in power in the 1st century A.D. but surrendered to Koguryo in A.D. 493. 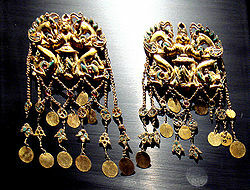 At the Puyo capital at Jilin, excavation of the Mao’ershan and Laoheshan cemeteries brought the discoveries of gold earrings and bronze cauldrons with pierced stands. These are thought indicate the Puyo culture as the early source of metalwork (as well as ceramics) technology for Korea of the Three Kingdoms period. The earliest bronzes are the “Liaoning daggers” found both in Liaoning in northeast China and in Korea, but the earliest of the daggers found at Shuangfang, eastern Liaoning date from the 13th -11th century B.C. and are found in the Liaodong peninsula in the Bohai bay area and in Korea, but nowhere south of the Great Wall of China. Between the 8th to 4th centuries, early types of Liaoning bronze daggers were found at several Korean sites but they are not thought to have been made in Korea because of the absence of moulds. Sometime in the 4th century however, around the time of the expansion of the northern Chinese state of Yan into the Liaodong peninsula, Daggers with the early Liaoning blade shape but with a notch win a part of the hilt were found in the southwest at Songguk-ri and are thought to have been produced in the south, along with the bronze spear-heads and fan-shaped axes which were definitely being produced in the south as their stone moulds have been discovered. At this time, slender daggers came to be produced and original shapes of bronze objects are seen from this period onwards. The Korean indigenous bronze culture in the southwest of the peninsula is believed to have taken off during the 3rd century with a great many Korean-style slender daggers being produced in the Kum river valley in southwest Korea. The 2nd century B.C. was a time of a great increase in Korean bronze production and many moulds have been discovered in the southwest, particularly in the Yongsan river valley. Not just bronze daggers, but also spear-heads, halberds (with narrower blades than Chinese ones), mirrors with fine geometric designs, sword-sheaths, horse-and tiger-shaped bronze belt hooks and jingle bells and pommel rattles that have come to be distinct marks of Korean bronze culture. It is thought that this was the period that Korean-style bronze weapons and mirrors were brought over to Kyushu in Japan. 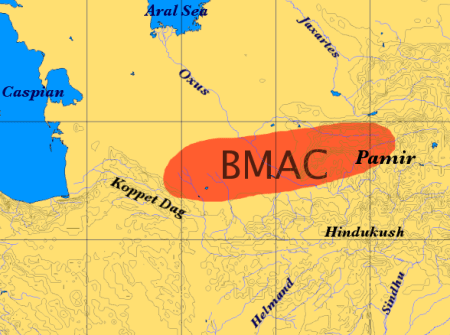 Searching for the Daheans, Daha, Dasas, Dasyus in Rig Veda, Daxia, BMAC, Margiana, 2,000-1,700 BCE This website’s resources on the Bactran-Margiana Archaeological Complex were particularly relied upon for comparisons with the Kofun cultural assemblage in Japan. Ancient history of Indo-Europeans: Eastern Iranic People | Bactrians, Saka Scythians and Tocharians This website’s resources posits the influence of the Persian-BMAC culture upon the Kushano-Sasanians, the Saka and Tocharian people, and Persians living from the Pamir mountains to western China. 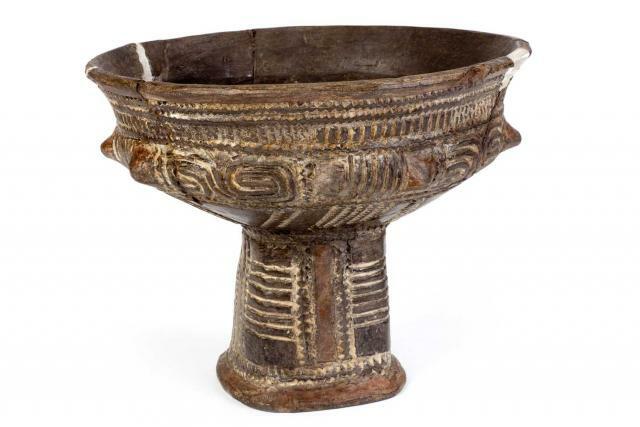 “The extent of exchange of art, ideas and innovations between cultural groups trading on the routes is illustrated by the eighth-century Shôsôin collection of artifacts. Culled by a Japanese emperor, it contains luxury goods from the Mediterranean, Persia, India, Central Asia, China, Korea and Japan. By the 16th century Europe was trading along the Silk Road routes as well.